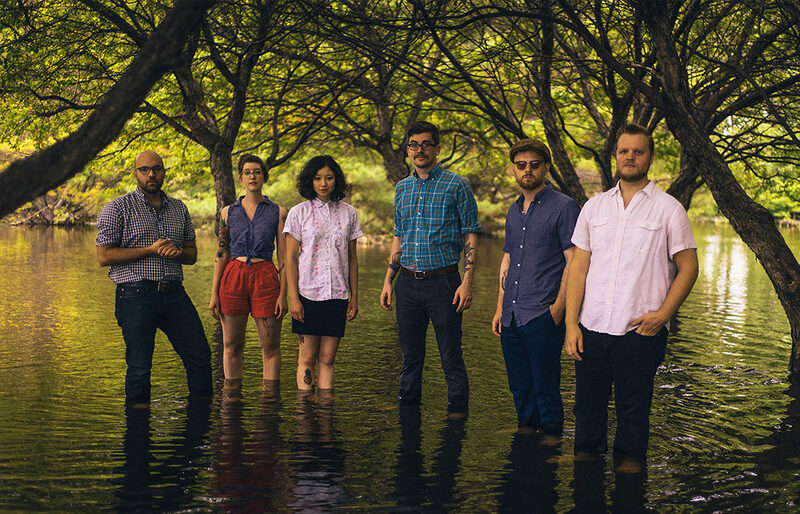 WINONA, Minn. — The Page Series at Saint Mary’s University of Minnesota will present a week-long residency with orchestral indie-rock band We Are The Willows on March 25-30 at locations throughout Winona. The residency culminates in a performance at the Page Theatre on Saturday, March 30, at 7:30 p.m.
We Are The Willows is a Minneapolis-based orchestral indie rock band featuring songwriter/frontman Peter Miller’s unique countertenor voice and guitar, supported by Jeremiah Satterthwaite (guitar/banjo), Leah Ottman (violin/voice/keys), Hilary James (cello/voice/keys), Travis Collins (bass), and Stephen Lindquist (drums/voice). We Are The Willows crafts dynamic, intimate songs with instruments and voices combining to create energetic rhythms, intricate melodies, and heartfelt arrangements that evoke shared nostalgic feelings of love and loss. Willows Around Winona: Band members will offer short, pop-up performances as a preview to their March 30 performance. Winona Public Library: March 25 at 4 p.m.
Senior Living at Watkins: March 26 at 5:15 p.m.
Blue Heron Coffeehouse: March 28 at 6:30 p.m.
Island City Brewing Company: March 29 at 5:30 p.m.
Winona Farmers Market: March 30 at 10 a.m.
To learn more about residency activities, visit pagetheatre.org. Tickets to the March 30 concert are $15 for the general public and $12 for youth ages 17 and younger. Tickets can be ordered online at pagetheatre.org, or by calling the Saint Mary’s Performance Center box office at 507-457-1715 (noon-6 p.m., weekdays). Now in its 32nd annual season, the Page Series connects professional performing artists from around the globe with thousands of Winonans each year. With events at the Joseph Page Theatre on the campus of Saint Mary’s University of Minnesota, as well as at locations across the Winona community, the Page Series offers dance, music, and theatre performances, workshops, classes, and more that inspire, uplift, educate, and invite community members to discover the relevance of the arts in their daily lives. Page Series community programs are made possible, in part, through grants from the Xcel Energy Foundation and the Elizabeth Callender King Foundation. This activity is made possible by the voters of Minnesota through a Minnesota State Arts Board Operating Support grant, thanks to a legislative appropriation from the arts and cultural heritage fund. We Are The Willows residency is made possible through a Minnesota State Arts Board Arts Tour grant, thanks to a legislative appropriation from the arts and cultural heritage fund.